Here is the exquisite piano you heard when listenting to Return to Inverness, as Mojo tickled the ivories and Jack Flanders sat down and pondered life, or leaped up and ran for it. George Schutz’s lovely improvisations will stimulate and relax your weary overstressed mind and muscles, in brief, simply cool you out with his heavenly touch. 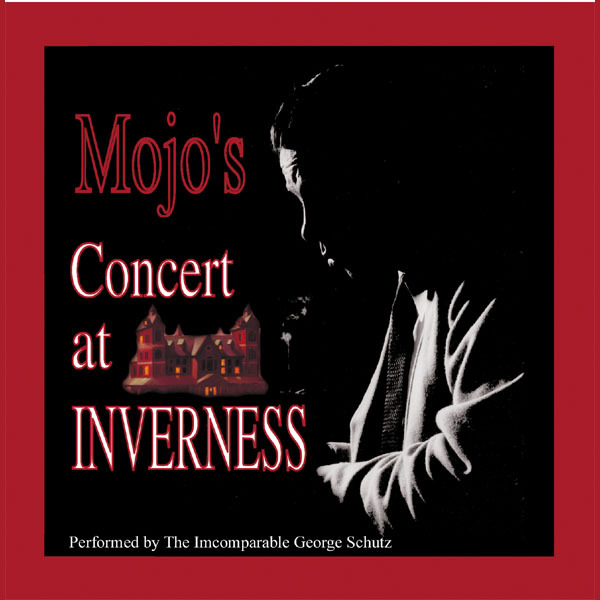 The Concert includes all of the songs you heard in Return to Inverness and more. Outstanding. Since buying this CD and “Mojo Plays Morocco” a few months ago, they have both become my most oft-listened to treasures. George Schutz on piano is outstanding. His music is relaxing and superb. This CD is perfect as general background music when pottering around the house or while entertaining visitors; while soaking in the tub, reading a book, or taking a country drive. The music may have been great as a backdrop to the Jack Flanders’ play, but its even better when enjoyed on it’s own. Highly recommended. follow up: and, by the way, Holy Moley! it came in the mail the next day!! Go ZBS!! This music is the highlight of Return to Inverness, and makes wonderful atmosphere in the home. While I have often marvelled at the atmospheres in the Jack Flanders stories, with native environments studiously recorded for the backgrounds, this collection of subtle, worthy pieces by a master pianist is a must have in it’s own right.